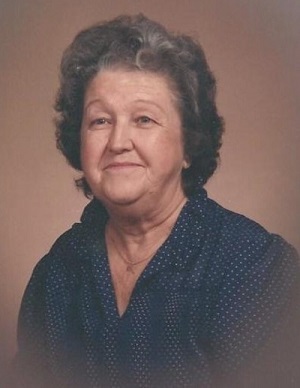 Mrs. Hazel I. Wilkinson, age 96, a native of Maxville, Florida, passed away peacefully on Thursday, April 11, 2019, at W. Frank Wells Nursing Home in Macclenny. She was born on April 5, 1923, in Maxville to Kyle and Wealthy Ann “Pea” (Griffis) Cannon. Mrs. Wilkinson was a homemaker and a member of Maxville Church of Christ. She also attended Long Branch Baptist Church. She was a beloved wife, mother, grandmother, great grandmother, great-great-grandmother, sister, aunt, and friend. Hazel was preceded in death by her parents; her loving husband of 60 years, Jr. Wilkinson; brothers, Bootsie Cannon, and N.L. Cannon; sister, Beatrice Hargroves; and granddaughter, Amanda Wilkinson Lowery. She is survived by her sons, Randy Wilkinson (Darlene) of Blackshear, Georgia, and Barry Wilkinson (Cathy) of Maxville; daughter, Shirley Jerkins (Don) of Maxville; sister, Virginia Canaday of Maxville; grandchildren, Donna Kelly, Justin Wilkinson (Julie), and Brooks Wilkinson; grandson-in-law, Dusty Lowery; great-grandchildren, Jennifer Rogers (Justin), Brad Astrauskas, Brandon Astrauskas (Michelle), Jeb Wilkinson, Jay Wilkinson, Jessi Wilkinson, Rhett Lowery, Luke Lowery, and Kate Lowery; great-great-granddaughter, Lettie Astrauskas; along with numerous other family members and friends. Visitation with the family will be held Tuesday evening, April 16, 2019, from 6:00 pm until 8:00 pm at Long Branch Baptist Church in Maxville. Funeral services for Mrs. Wilkinson will be conducted at 11:00 am on Wednesday, April 17, 2019, at Long Branch Baptist Church with Pastor Terry Ryan officiating. Interment in Long Branch Cemetery will follow. Pallbearers are Bruce Cannon, David Ray Wilkinson, Justin Wilkinson, Brandon Astrauskas, Brad Astrauskas, and Brooks Wilkinson. Honorary Pallbearers are Harvey MacPherson and Jerry Padgett.